Boat International stepped aboard the 43.31m Royal Huisman sailing yacht Blue Papillon yesterday, as part of the annual HISWA tour of Dutch yacht builders and design studios. 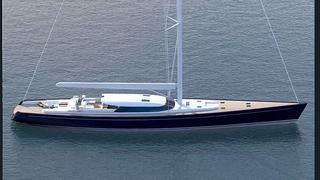 The all-aluminium sloop, designed by German Frers, was ordered at the end of 2010 and launched just two weeks ago. She is now receiving finishing touches in Harlingen, The Netherlands, and will be completed in the next few weeks. She was expected to undergo her first sea trial after we left her yesterday. Blue Papillon's exterior design is contemporary, with a low-profile deckhouse. Aft there is an owners' cockpit with, to-stern, access to the water from broad fold-out stern staircase and forward, access down directly into the owner's suite. Forward of the owner's cockpit are twin helm stations with touch screens, which can be covered by a canvass bimini that fits over a solid frame. Forward again is a recessed social area with built-in sofa seating, covered by a hard top. This sits against the deckhouse forward, which has big windows and a central glass door, all of which can be slid away in a clever, jigsaw-like system. The saloon is a spacious area well lit by large windows, while forward in the same space the wheelhouse offers excellent visibility. Below on the lower deck are three guest cabins and the full-beam owners' cabin aft, featuring a seating area and office space. There are mirror-concealed TVs in all cabins and head heights of at least 2.10m. The Rhoades Young interior scheme uses cream carpets, silver-grey upholstery, rich walnut and pale washed maple woods. There is a decent-sized galley and crew area forward on the lower deck, with direct access to the foredeck where there is a tender hatch. Below the waterline, Blue Papillon has a moderate fixed-bulb keel and a deep carbon rudder. Above, she has a full-carbon Rondal rig giving an air draft of 57.35m. The main engine is a single 533kW Caterpillar C-18. We hope to bring you more on Blue Papillon in the near future.